(Last Updated : 04.04.19). 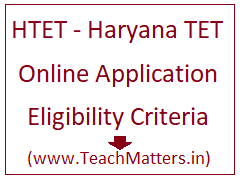 HTET Online Form 2019 : Apply Online for HTET 2019 - Haryana Teacher Eligibility Test 2018 Exam OMR are available now to download w.e.f. 04.04.2019. Last date for Online Application was extended up to 03.12.2018. Candidates who appeared in in Haryana TET JAN 2019 Exam can now download their OMR Sheet of HTET Exam January 2019 through Board's office whose detail is available at official website of HTET 2018 i.e. www.htetonline.com. Board of School Education Haryana Bhiwani (HBSE) conducted HTET 2018 Examination on 05 & 06 January 2019 for all three levels - Level-1 (PRT), Level-2 (TGT) & Level-3 (PGT). Check here HTET 2019 Online Application Form 2019 Eligibility Criteria and Apply Online for HTET 2019. HTET online application last date was extended up to 03.12.2018 on the official website whose link is given here below in the post. HTET Exam Notification 2018 was released on the official website of HTET 2018. Candidates are searching for HTET Apply Online Link but online application link is available only through this website i.e. www.htetonline.com. Last time HTET Online Application Form were available on thees websites also - hbse.ac.in and www.htet.nic.in. But this time these websites are not active for HTET 2018 Online Application. So, candidates are advised to use this link. Here is detailed procedure for online application of the TET exam January 2019. Candidates are advised to read detailed notification and instructions before apply online. Candidates are also advised to check Eligibility Criteria for HTET 2018-19 for the level they are apply for. Graduation (or its equivalent) with 50% marks and passed or appearing in final year of 2 year Diploma in Education or 1 year B.Ed. Note : For Educational Qualification for subject-wise post, read detailed educational qualification. Post Graduate Degree (or its equivalent) with at least 50% marks in the concerned subject and B.Ed. Candidates who want to apply online for the TET Exam 2018 can apply online through official the website. Here are steps to apply online for HTET Exam JAN 2019. Take printout of Computer Generated Application Form (Confirmation Page) and should keep with you. The Confirmation Page of HTET 2018 will be submitted in the exam centre at the time of HTET Exam on 05 and 06 January, 2019. Thumb Impression on the Confirmation Page should be applied on the prescribed space in the presence of Invigilator/Supervisor in the exam centre. Candidates are advised to read Detailed Notification/Instructions and Exam Scheme/Eligibility Criteria of HTET 2018 before apply online for HTET January 2019. Candidates can apply online now for the Haryana TET 2018 from 19.11.2018 to 30.11.2018 through the link given below. Sir thumb impression mai correction kese hogi .Maine galti se right hand ka thumb lga diya hai. Update your latest thumb impression as per the schedule. The link is open now.